The legendary Sutton Place Hotel, just steps to Bloor and Yorkville will be injected with new life. British inspired architecture, design and amenities. The Britt, is where classy meets classic and historic meets epic. The Britt will offer a wide selection of studios, one, two and three bedroom condos, designed for gracious living with premium features and appointments. A classic balance of form and function, each suite will feature bright and spacious open concept layouts and individually controlled heating and cooling system. 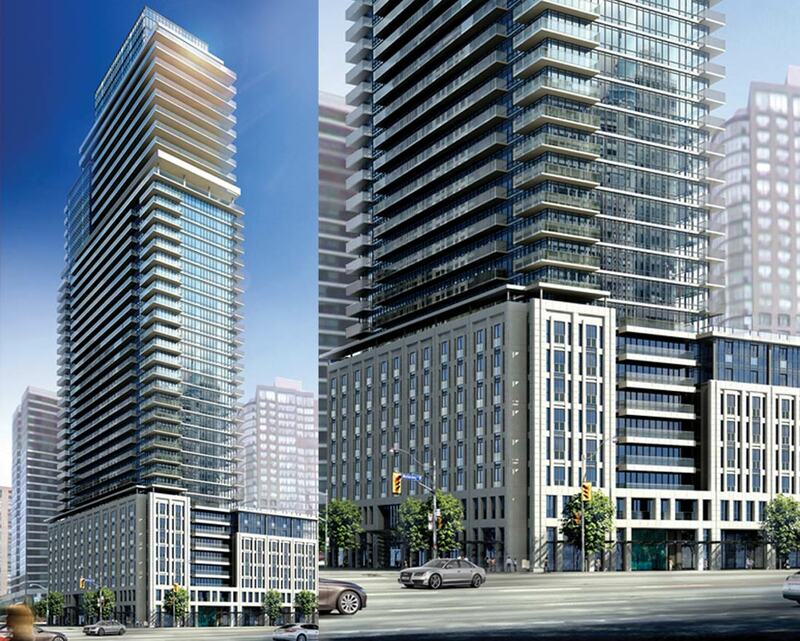 Lanterra is converting the Sutton Place Hotel in Toronto into a 41-storey condo – The Britt – adding nine storeys to the top of the existing slab structure as well as an eight-floor podium that wraps around the base of the building. Designed byPage + Steele/IBI Group Architects, The Britt will have 649 units, ranging from 334-square-foot studios to 1,292-square-foot three-bedroom suites. Prices go from $275,900 to $1.25 million. The project is on sale now and the revamp is slated to begin this fall. Condos at The Britt will have engineered hardwood flooring in the living and dining rooms and den areas, and broadloom in the bedrooms. Residences also will have a stacked washer/dryer with ceramic tiling in the laundry area. Kitchens will have granite countertops, ceramic tile backsplashes and stainless steel appliances, with a built-in microwave and integrated, slide-out range hood. Bathrooms come with marble, porcelain or ceramic flooring, marble countertops with ceramic sink basin, and a five-foot soaker tub or shower with glass paneling. Lanterra’s aim with The Britt is to restore the building to its former grandeur, paying homage to its fabled past while reasserting the tower’s presence at its prime Bay and Wellesley Sts. location. Interior designer Alessandro Munge, of Munge Leung, taking cues from what he observed on the London tour, has conceived a two-storey lobby space for The Britt that couples classic flourishes — a grand staircase, marble-faced portals and glass chandelier — with contemporary elements such as Harlequin-patterned black and white floors and white walls. There will be private lounge. The Britt condo will offer high-end hotel-like services and amenities, including a 24-hour concierge who can book restaurant and entertainment reservations, housekeeping, event planning, grocery shopping and delivery, laundry and dry-cleaning, pet walking and grooming, as well as car rentals, a car share program and automobile maintenance and detailing. The new eight-storey podium will wrap around the base of the existing building, helping The Britt to better integrate with its surrounding environs than did the old Sutton Place. Amenities at The Britt include a pet spa, party room with kitchen facilities, theatre room, fitness centre and spa. The condo will have two rooftop terraces, one on the second floor with barbecues, fireplaces and lounge areas, the other on the ninth floor with an infinity pool, hot tub, additional lounge areas and an adjoining party room with kitchen.